Join the discussion on our forums! 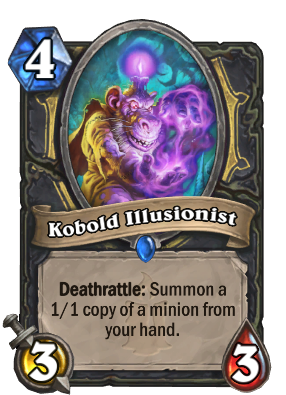 Come discuss Kobold Illusionist over in our dedicated Kobold Illusionist discussion topic. Probably one of the most underrated cards in the current Meta. This card + Malygos is pretty much the end. You can throw in Spiritsinger Umbra for kicks but its unnecessary. Uhhhh, monsters behind monsters behind monsters behind monsters behind monsters behind monsters behind you! This, Kobold or Thalnos, backstab it, summon your malygos, 6 spell power, 4 mana and up to 6 cards left excluding the malygos that already served his purpose. IMO this could be the most underrated card. This is Rare now, because Blizzard has no idea how to reveal rarities correctly. The difference between deathrattle and battlecry on this card. I'm sure someone on stream will lose to this card once, but the other 99 times out of 100, this card did nothing. If this card read battle cry it has some meme value. Keep in mind this is a rogue card not neutral. As a deathrattle effect it's a solid 5 dust. So you get a more valuable barns for 40 dust huh? feelsgoodtobearogue I guess. Damn those salty otks, so bad I dont own a malygos. This is not consistent enough for malygos to be more than a meme deck. However, theres potential for pulling questings and auctioneers, possibly other cards. Rogue needed a new 4 drop, this might be it. You just need to have a variety of good pulls, not built relying entirely on one specific pull. Turn N : Equip Shadowblade and play any minions so that this and Malygos would be only minions in your hand. Turn N+1 : Play this and cast Doomerang. Now kill opponent with remaining 5 mana. A more conditional Barnes. Going to be hard to only have the minion you want to copy in your hand when this dies. I'm sure many combo shenanigans will be had.